We're baaaaaaackkk!! Well, really, Food'N'Flix, is back. We've been on a hiatus from Food'N'Flix, the movie-watching, food-making group rallied by Heather of All Roads Lead to the Kitchen. Now for September's Food'N'Flix, she has asked us to celebrate the club's 8th birthday by watching any of the previous movies. 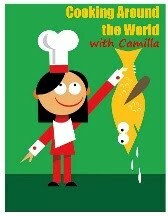 Here's her invitation. What fun! 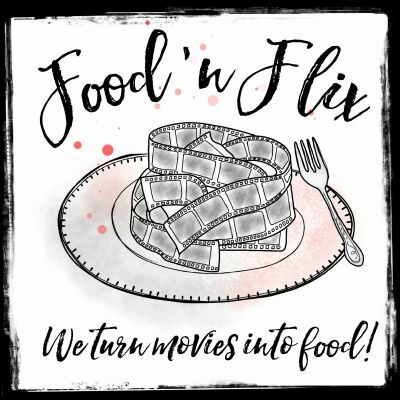 Before I get into the movie and dish I picked for this month, I decided that I would link up some of my favorite Food'N'Flix posts through the years. It looks as if I didn't join the fun and games until 2012, but I've participated pretty regularly since then, even hosting at least one event per year. I really enjoy that the movies run the gamut from drama to animated children's flicks. It's been a fun project and I'm glad we're back from the break. Also, I will be going back and watching - and cooking - from the films I missed. So, stay tuned for those. For now, here are some previous Food'N'Flix posts. When I was looking back through the schedule of films, I debated between Tampopo and Tortilla Soup*, thinking that the season was turning cold and I was in the mood for soup. But, since I had just made a 20+ hour broth and homemade ramen, I opted to go with the second movie. We meet Martin Naranjo, a widower who is a great chef, but is depressed because he has lost his senses of taste and smell. He, now, cooks mainly for his three adult daughters who all still live at home. As you can imagine, there's plenty of room for family drama and lots and lots of food in this heart-warming comedy. There are marked similarities between this movie and Eat Drink Man Woman. And I do love the vivid, delectable food photography that reminded me of Big Night or Babette's Feast - both are favorites of mine. 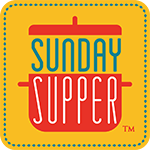 Whereas Big Night showcases Italian cuisine and Babette's Feast features Danish fare, Tortilla Soup makes your mouth water for Mexican food. I considered actually making tortilla soup. But when I went looking for a pumpkin - for a different event - one of the farmers gave me this silvery blue beauty, a Jarrahdale pumpkin. I brainstormed with the boys about what Mexican recipes could incorporate a pumpkin and we landed on posole. Posole is definitely one of our favorite Mexican soups, though Albondigas is a close second! Preheat the oven to 375 degrees F. Cut the top off the pumpkin. Scoop out the seeds and strings. Pour 1 C water + 1 C chicken stock into the pumpkin. Replace the lid of the pumpkin. Roast the pumpkin in the oven for about an hour. In the meantime, make the soup. Place your pork in a large mixing bowl and rub the meat with the smoked paprika, ground cumin, salt, and pepper. Add a splash of olive oil to a large Dutch oven. Cook the onions until they are softened and translucent. Add in the pork and cook until browned. Stir in the garlic, celery, carrots, oregano, and bay leaves. Pour in the remaining liquid and bring to a boil. Reduce the heat to a simmer. Let cook for 60 minutes. Stir in the hominy and carefully ladle the soup into the roasted pumpkin. Replace the lid and bake another 30 minutes to finish cooking. Season to taste with salt and pepper, as needed. Serve hot. As you serve into individual bowls, spoon with some of the pumpkin flesh into each bowl. Thanks, Heather! I've missed you. I hope you're doing well. What a gorgeous presentation of this soup Cam. 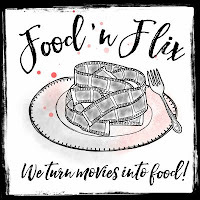 I am so happy that FoodnFlix is up and running again.